Peter Scarola, pastry chef at R2L restaurant in Center City, removes a baking sheet of cookies from the oven during a Philadelphia Science Festival event on Tuesday. This year's Philadelphia Science Festival is almost over — although you can still catch the big finale, Saturday's Science Carnival on the Parkway, packed with experiments, games, and food trucks. Needless to say, I had a blast at every event I attended, learning about everything from the chemistry of baking the perfect chocolate chip cookie to how to use psychology to become better at networking. The nine-day citywide celebration of science was chock-full of lectures and demos that fell right in line with the curious spirit of my column, “The Science of Everything.” What follows are recaps of some of my favorite events from the festival, along with a small taste of the science that was covered. 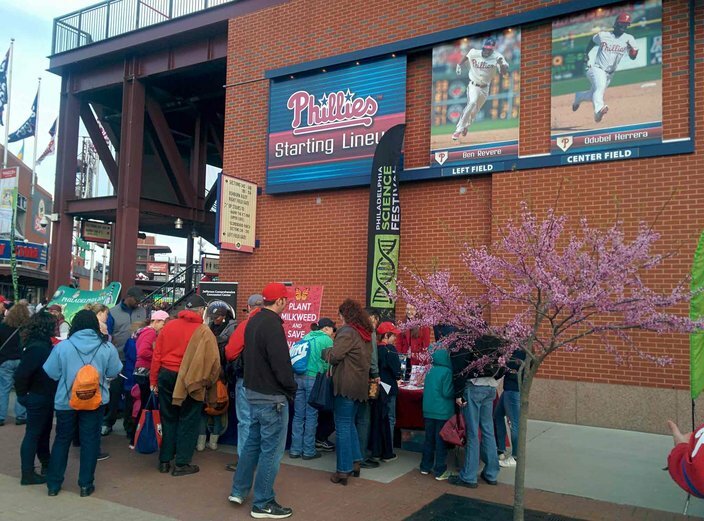 For this sports science-themed event, our beloved Phillies took on the Atlanta Braves at Citizens Bank Park on a brisk Saturday evening. Even though the home team ended up losing, ballgame attendees got to soak up some science taught by a dozen exhibitors on the main level of the first floor concourse. At Science Night at the Ballpark, the University of the Sciences had a demonstration where kids could swing a baseball bat and compare their speed to elite athletes. While a child athlete under 10 years old manages about 45-55 miles per hour, a professional player can reach speeds up to 95 miles per hour. But bat speed is only one variable that influences exit speed, or the speed of the ball as it comes off the bat, which is really the ultimate goal in hitting. Other factors include pitch speed, impact point on the bat (“sweet spot”), and the composition of the bat and ball. 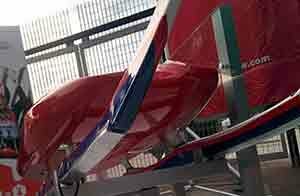 The Dow Chemical Co.'s exhibit had a real luge sled on display, left, that its research scientists engineered for the USA Luge team. Dow's new designs, faster and more reliable than previous versions, were the first new sleds for the team in almost two decades. The focus was on improving the steering mechanism, called the kufen (German for “runners”), that look like two hockey sticks attached to the bottom of the sled. Usually made of fiberglass or wood, the kufen need to be solid enough to steer properly, yet soft enough to dampen vibrations as the sled travels in order to maximize speed. After building and testing many prototypes, Dow material scientists settled on a strong, lightweight mixture of plastics that includes carbon-fiber. In essence, networking is just about getting to know more people and building upon those connections — and we all know that human relationships have the ability to positively impact our careers, social lives, love lives, and health. An event held Tuesday at the University City Science Center's Quorum, called Science of Networking, explored what areas of our brain become activated while networking and how to use that science to effectively grow our networks. Matt O'Donnell, a research scientist at the University of Pennsylvania's Communication Neuroscience Lab, started off the event by speaking on the neuroscience of networking. He argued that the key is being able to mentally step into another person's shoes and exercise the regions of the brain involved in perspective taking, such as the temporoparietal junction. In psychology, this is called “theory of mind,” defined as our ability to reflect on the goings-on of other people's minds. He attempted to recreate one of his experiments from the lab and had attendees pitch their neighbors on a certain product to one another, like a pen with a video and audio recorder built in. Afterwards, O'Donnell revealed that the most successful salespeople were those that used social language cues like “you,” “family,” and “friends.” During their spiel, these subjects had increased activation in those theory-of-mind brain regions. What makes a perfect chocolate chip cookie? It is all a matter of taste, of course — some prefer thin, crispy batches while others love soft-baked, chewy cookies. But how do you tweak a standard recipe to create your ideal version of this simple all-American dessert? 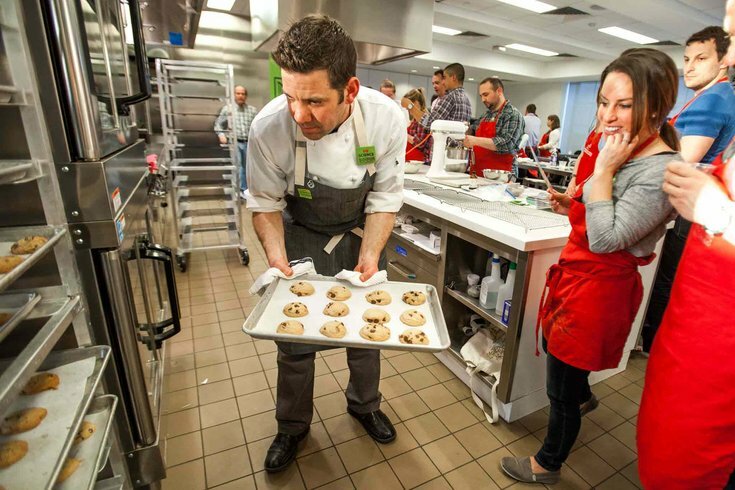 Peter Scarola, the pastry chef of ritzy Center City restaurant R2L, teamed up with the Franklin Institute to teach the scientifically delicious Cookie Lab event on Tuesday evening, where I learned all about the chemistry of chocolate chip cookies. 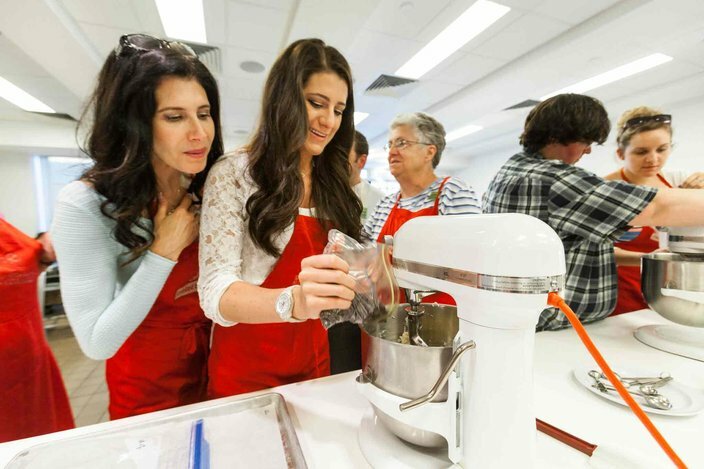 At the Parkway Central Library's new demonstration kitchen in the Culinary Literacy Center, nine groups were each given a slightly altered version of the original Nestle Toll House chocolate chip cookie recipe to bake. For instance, one recipe had all white sugar instead of the classic mix of brown and white, others used gluten-free flour or bread flour, and another substituted shortening for butter. The participants recorded guesses on how their final cookies would turn out, then donned red aprons and sipped on White Russians — an adult version of milk and cookies? — as they got busy baking. The finished products varied from flat to puffy, cakey to crispy, and everything in between. Bread flour contains more gluten and thus adds a chewy texture. Shortening makes for a softer cookie, but is missing that luscious butter flavor. As for sugars, brown sugar contains molasses which is more acidic than refined white sugar. That acid activates baking soda, which results in taller cookies. Unfortunately, his own spin on chocolate chip cookies is a secret — but he does admit to using a mix of different chocolates rather than only semi-sweet chocolate morsels. The event started with a flower for every audience member and ended with delicious free cookies. The stand-up comedian who hosted the show not only received ample laughs, but also gave away over 25 raffle prizes. Even a few friendly, fluffy therapy dogs made a surprise appearance. Let's Get Happy, Thursday's event on the science of happiness, used every trick in the book to delight and thrill the audience — and it worked. Twinkling red, blue, and white Christmas lights stretched across the ceiling of Ruba Club's upstairs ballroom, where a packed house heard six talks on topics as diverse as the evolution of chocolate, why hospitals use therapy dogs, and how meditation can change your brain. David Yaden, a researcher at the University of Pennsylvania's Positive Psychology Center, kicked off the event with his summary of what science has learned about happiness. Positive psychology is the study of happiness and well-being, as well as the strengths that enable individuals and communities to thrive. Scientists have found more objective ways to measure happiness using tools like a life satisfaction scale, which asks respondents to agree or disagree with statements like “In most ways, my life is close to my ideal.” That life satisfaction score can then be correlated with other measures, like salary or gross domestic product, to find out more about what links with happiness. “In the lab, we don't think of happiness as just one thing — we think of happiness as part of a greater whole called well-being,” Yaden said. He then described the PERMA model of well-being: Positive Emotion (peace, gratitude, pleasure, etc. ), Engagement (state of flow when working), Relationships (other people matter! ), Meaning (a connection with something bigger than yourself), Accomplishment (achieving your goals).